While it may seem daunting, living on one income is possible if your willing to work hard and make sacrifices. It’s not as bad as it sounds though when you consider what you will be gaining including, more time with loved ones and more freedom to do what you enjoy. Living well in my opinion is being happy, content and free. 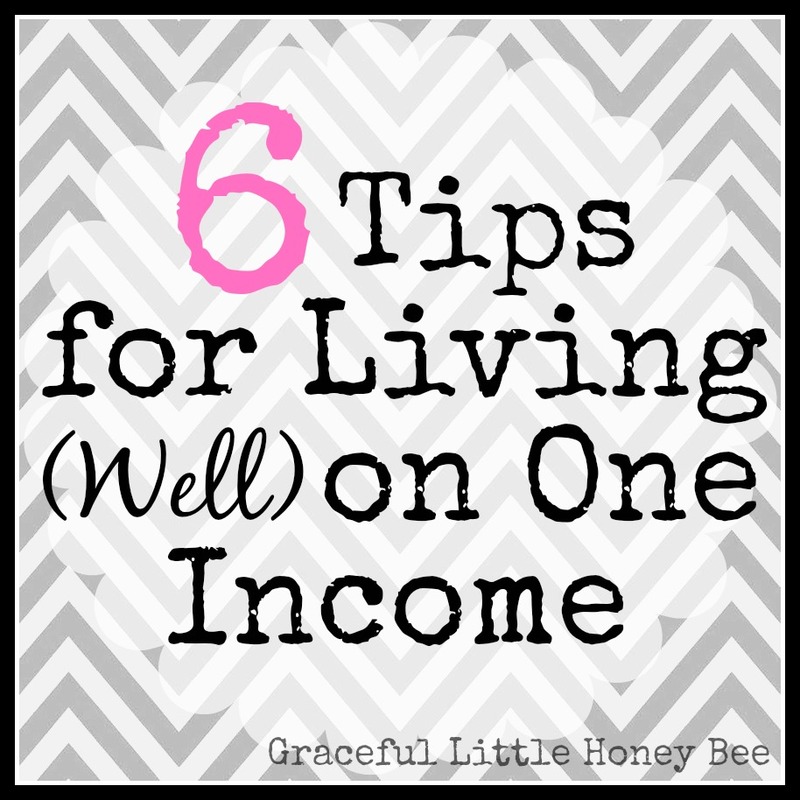 Check out these tips on how to thrive on one income and start living your dreams today! To make living on one income work, the whole family has to understand why it’s important for mom or dad to stay home. Why is living on one income a priority to your family? Keep this reason in the front of your mind and understand that it’s more important than the luxuries you may be giving up to be home with your kids. Let’s face it, to stay at home you’re probably going to have to make sacrifices. Decide with your spouse which non essentials you’re willing to give up (cable, magazine subscriptions, gym membership, steaks, eating out, etc) and cancel them. Evaluate how much house/car you really need and cut where you can. Did you know that the average American home has doubled in size since the 1950s, yet families are smaller? If our ancestors survived with less space, then we can too. Plus, smaller house = lower payment = more money in your pocket. The same goes for vehicles. Does your family need more than one? If so, can you sell one of your current vehicles and use the money to pay cash for an older one? As long as your car gets you safely from point A to point B then what else matters? Did you know that the average American is $15,000 in debt?? Chances are the people who you envy that have nice houses, cars, etc are stressed out because of the debt load they’re carrying! Don’t be like them. Be grateful for what you have. If you have food in your fridge, clothes on your back, a roof over your head and a place to sleep then you are richer than 75% of the world. Seriously. Like yesterday. Cut up your credit cards and make it a priority to pay off your debt. Imagine how good it will feel when you don’t owe anyone anything. If you need help in this area I would recommend reading Total Money Makeover by Dave Ramsey and following his baby steps. You can also visit DaveRamsey.com for more resources. When you read books like, Little House on the Prairie, what types of food was Ma usually cooking? Potatoes. Soups. Homemade Breads. They ate simply because they had too. Things like out of season produce and candy were luxuries to be enjoyed occasionally. If you can learn to cook from scratch and simplify your menu plan (think spaghetti, chicken noodle soup, beans and rice) then you will save tons of money. Unless you find an awesome deal on convenience food, you can normally make it yourself for way less. What other money-saving tips would you add? Don’t forget to subscribe and follow on Pinterest, Facebook and Twitter! Just discovered your blog from Pinterest! Love this article as we are venturing into the one income territory. I made the choice to take a leave from teaching and stay home next year. My youngest starts middle school next year and I want to be more available to her. Can't wait to check out more of your blog! Thank you for these tips. I think the big one is think smarter than the Joneses. One thing we did was we got rid of one of our cars and a lot of our family didn't understand it but now our insurance bill, gas, and car repairs are all manageable now.